Why does Teams not install for my users? Microsoft released in October last year a MSI-installation package of Teams, making it easy to deploy Teams to computers in your organization. As you know Teams (for some unknown reason) installs directly into your profile. I suspect they have designed it this way to make sure everyone can install the application, even if you’re not an local administrator on your computer, you do have sufficient rights to your profile to perform a installation of Microsoft Teams. Since I work primarily with Citrix, and could see the that Microsoft Teams is growing in popularity, I started to investigate if I could make it to work in a Citrix environment. But that is another story, you can read my blog post on how I installed Teams in our Citrix environment here! Teams is supposed to install when a user logs on to the server, it will automatically install the latest Teams available to your profile and then start it. But in some cases I have seen an issue after installing the Teams wide Installer, the users simply does not get anything installed. A function this installer has is that it checks your profile for traces of Teams, if it detects part of Teams it will not try to install it again (if it’s not an update that is), and if the user uninstalled Teams it will still detect some left-overs and will therefore not install Teams again. With that said, you need to make sure your profile is clean from Teams. Unfortunately this was not the case here. It simply did not install! To understand why this might happened you need to know how some multi-user environments are designed, from a security perspective! If you are like us, security oriented, you might have disabled Run and Run Once witch is used by some applications to auto-start, or to continue a installation after a restart, and is unfortunately very popular place to auto-start viruses and other malware. It is then common to disable this. This is exactly the place Microsoft Teams specify the value that starts the Teams installation for a user, if its disabled, nothing will ever happened! Save it, and place it in the Startup folder in the Start Menu. The last argument in the Target path (–CheckInstall –source=default) is the reason Teams knows if you have it installed and keeps it updated. I hope this easy little trick has been helpful, please make a comment if you feel like it or have some questions! 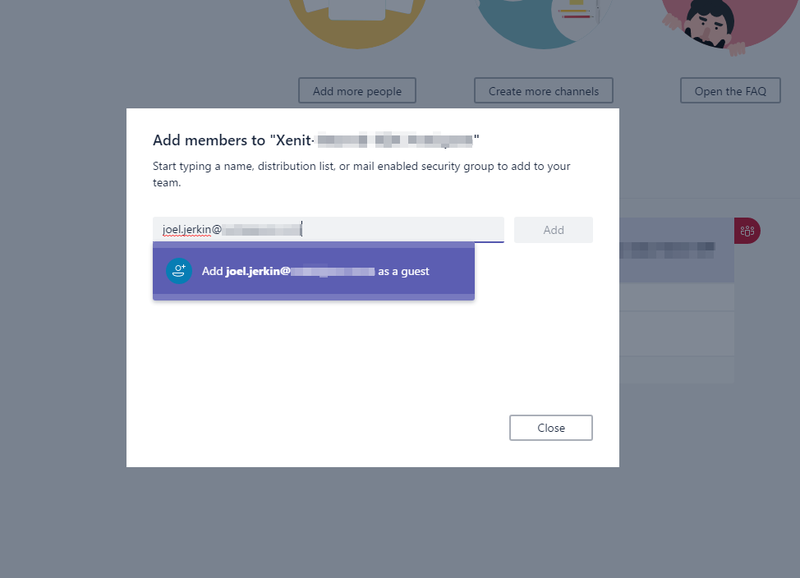 Yesterday Microsoft made one of the most request feature for Microsoft Teams general available, Guest Access for external users. Guest access allows you to add people from outside your company and organisation to a team, so they can participate in chats, join meetings, collaborate on documents and more. At the moment, anyone with an Azure Active Directory (Azure AD) or Office 365 work or school account can be added as guest in Teams. Microsoft will later on add the ability to add anyone with a Microsoft Account (MSA), like Outlook.com or Live.com. 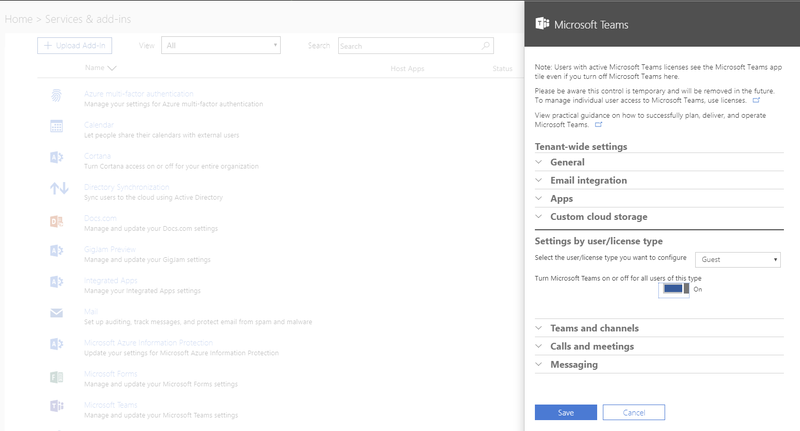 To enable Guest Access in Microsoft Teams, an Office 365 Administrator will have to logon to Office 365 Admin Center and go to Microsoft Teams under Services & add-ins and change Settings by user/license type to Guest and turn the feature On. 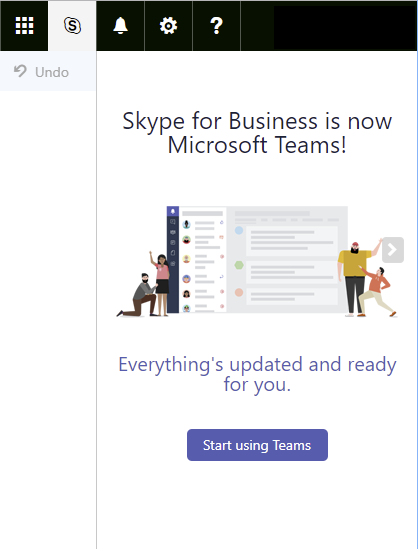 In the Office 365 Admin Portal, MC118018 was published by Microsoft and later removed, stating that they are starting to upgrading Skype for Business to Microsoft Teams. 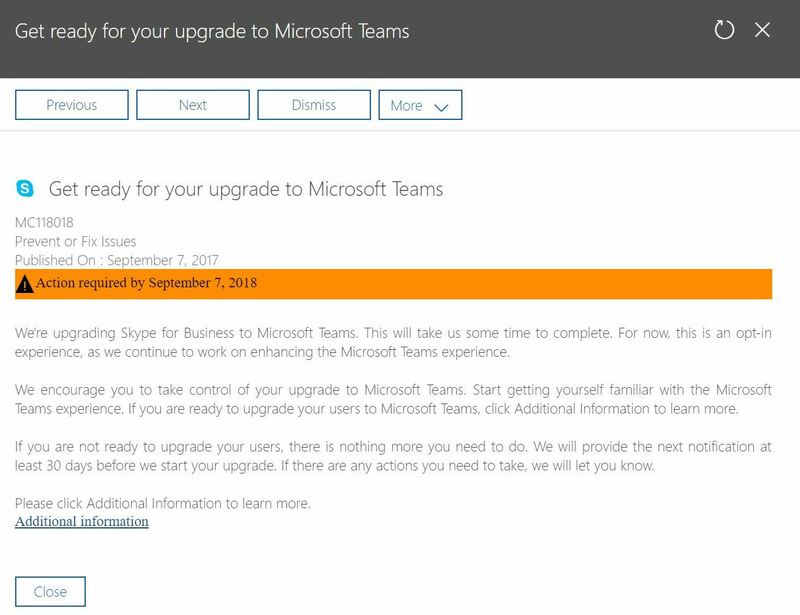 The notice stated that for now, this is an opt-in experience, so it’ls not an immediately change by Microsoft, but as an action is required by 2018-09-07 it sure looks like you will be forced to upgrade. There have not been an official announcement from Microsoft, yet but as Microsoft Ignite is less than a month a way we might see a few new announcements there and one of them might be that Skype for Business will be upgraded to Microsoft Teams.